Vitamin-rich seasoned Sugar-Simmered Shiitake Mushrooms. Being marinated overnight in carefully seasoned soup stock gives these shiitake mushrooms a rich, full-bodied flavor. Seasoned with Chintan’s versatile spice mix. Originally cultivated in East Asia, shiitake mushrooms are now estimated to make up a quarter of worldwide mushroom production. They have been used medicinally and as a food in Japan for centuries, and are now popular around the world. 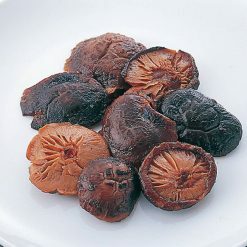 Prepared and packaged in Japan, these Chinese Sugar-Simmered Shiitake Mushrooms are richer in Vitamin D than their dried counterparts. They also provide a notably high amount of iron per calorie. This richness in iron combined with a satisfying texture is part of the reason that shiitake mushrooms are so beloved by vegetarians too. With the striking umami that shiitake mushrooms are known for, this might be that final missing ingredient you’ve been searching for. To thaw, place in the refrigerator, or under running water if you’re short on time. Otherwise, transfer to a bowl, place in steamer, steam on high for 2-3 minutes, and then on reduced heat for 10-12 minutes.Our Sugar-Simmered Shiitake Mushrooms require limited preparation, and add an umami-filled punch to any dish.In addition to adding body and flavor to a bento lunch, they also make an excellent addition to unrolled sushi dishes as well as Chinese recipes. This product contains dried shiitake mushrooms (previously marinated) (China), soy sauce, sugar, rice fermented seasoning, seasoning extract (pork, chicken, vegetables, bonito, kelp, yeast), salt (includes raw wheat). 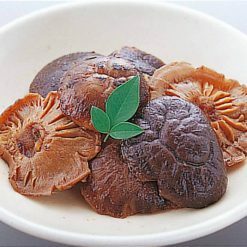 Origin of ingredients: shiitake mushrooms (China). Prepared and packaged in Japan.